I love newborns. They are my favorite subjects to photograph. I enjoy capturing new life and notice the finest details of your newest family member. From the flakey new skin to the tiny new toes, from the pouty lips to the tender curls or no hair at all; I enjoy capturing the true essence of your newborn and providing you with images you will always treasure. Please contact me BEFORE your baby arrives. A tentative session time will be reserved based upon your due date. If you love the curled-up look in newborn photography, the best time to achieve it is during the first two weeks of baby’s life. During this time, they have that special freshly born look that won’t be there for long. I prefer this age for newborns because they are less likely to be disturbed while sleeping, are more cooperative and less likely to have newborn acne, which usually flares up around 3 weeks of age. I will bring my gear and equipment to your house, so that you do not have to worry about leaving the comfort of your home with a brand new baby. Although I bring my studio light I will look through your house a bit to find the best spot to set up in…usually one where I do have some natural light to use as well. Your Home: To keep your little one as comfortable as possible and to prevent blotchy skin, I advise raising the temperature in the house about 10-15 degrees, starting 30 minutes to an hour before the session is to begin. We will need the temperature to be in the mid-80′s at least. I do bring a small space heater that can help us get to the ideal temperature. If we’re hot, then the baby will be comfortable to sleep through the session, so be prepared to be sweaty. The end result will be worth it! Your Newborn: It’s best to keep your newborn swaddled in a loose diaper and blanket prior to the session. This way the baby will not be disturbed, as no clothes will need to be removed. Also, keeping the diaper loose helps prevent marks on their skin. No need to worry about feeding baby or having her asleep before I arrive. It will take me a bit to find the right spot in your home, unload everything from my vehicle and then set it up. During this time you may want to feed baby. But no need to stress over this. We want baby and mama to feel relaxed and happy. NOTE: During newborn sessions only those who are to be photographed should be present. However, it is fine if a grandma or other helper is there. The point is we don’t want too much activity and noise. There are already a lot of stimulants for newborns in a session – from the feel of different fabrics, to the lights, to talking etc. Too many people may disrupt the session and distract me. Yourself: There is no need to worry if you are not feeling 100% yet. Throughout the session, I will work with your baby – posing and cuddling them to sleep in order to attain the captures I want to achieve. You will be free to relax and watch or take care of other things around the house if you wish. The session will never be rushed. We’ll take our cues from your sweet newborn to make frequent breaks for feedings and changing. I’m in no hurry and I will wait while your baby is comforted, fed, changed etc. Just remember… I’ve seen it all and I LOVE every minute of it. I come ready to have fun. Clothing: Most newborn images are done without any clothing. However, I love adding some texture to the image, so I will bring hats, blankets etc. If there is a special hat or blanket that you would like to use that is fine too. For yourselves, I advise wearing a simple black short-sleeved t-shirt for dad and also have some neutral (cream or white is nice) color outfit handy for a change. Even if you don’t want your face in the images, we may use you as a backdrop at some point. You may want to make sure that your nails are clean/shaped, as your hands may appear in several images. Please don’t worry if your baby has an “accident” during the session. All of my supplies are laundered/dry cleaned and sanitized after each session. You may want to have an extra outfit on hand for yourselves though in case you’re the lucky recipient. Sessions are tailored to the individual newborn. If your little one sleeps the whole time, your session could last about two hours. However, it may very easily last up to 3 hours (and longer) depending on the needs of your baby. Plenty of time is allowed for feedings and snuggling. Ideally, I like them sleeping the entire time. Please do not hesitate to contact me if you have any questions or concerns. 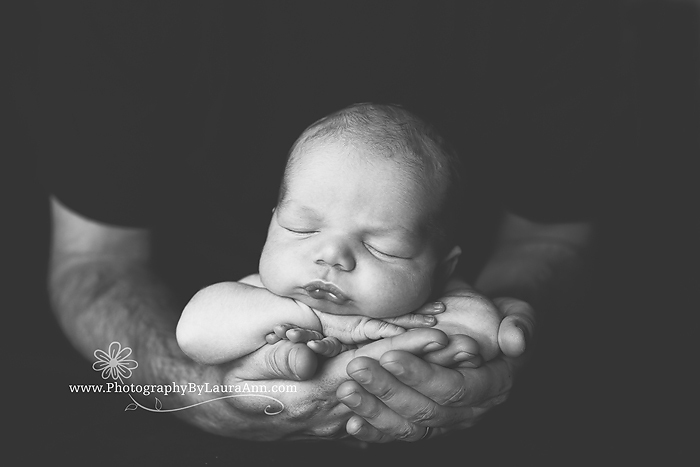 Click here for some samples of my newborn work.